So over the holidays I set out on a pretty big endeavor. I had two problems to solve. First I needed a compact way to transport all of the gear for a particular character’s costume. 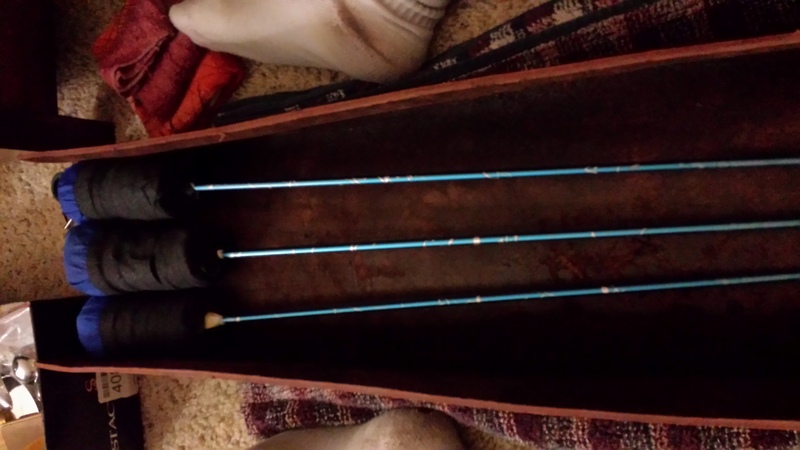 Second, I needed a way to carry contact-sport arrows that was convenient and prevented them from all falling out whenever I ran or bent over. 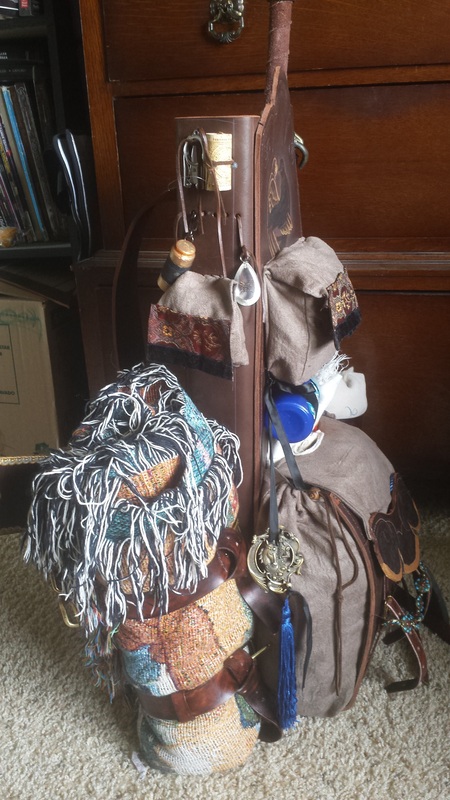 The the solution I settled on was to cross a quiver with a backpack, and carry the whole thing on a heavy-duty belt rig. It took weeks of research to settle on a design to try. I decided to give a try to this Buskador fellow’s theory on how to pack arrows tip down and in rows to maximize space usage, I figured the snug layered fit should keep the arrows from falling out. 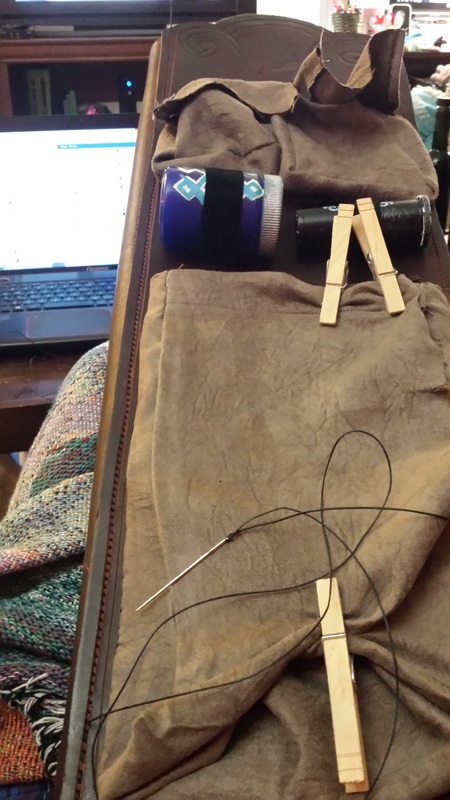 So I got to work measuring my arrows, and making a fabric prototype to test the idea. I wanted mine to stand on it’s own when I set it down so I went for a boxed in bottom panel instead of the original tapered fit that Buskador used. The fabric prototype worked beautifully, the only catch being that the floppiness of the fabric made it a little hard to draw and re-pack the arrows. 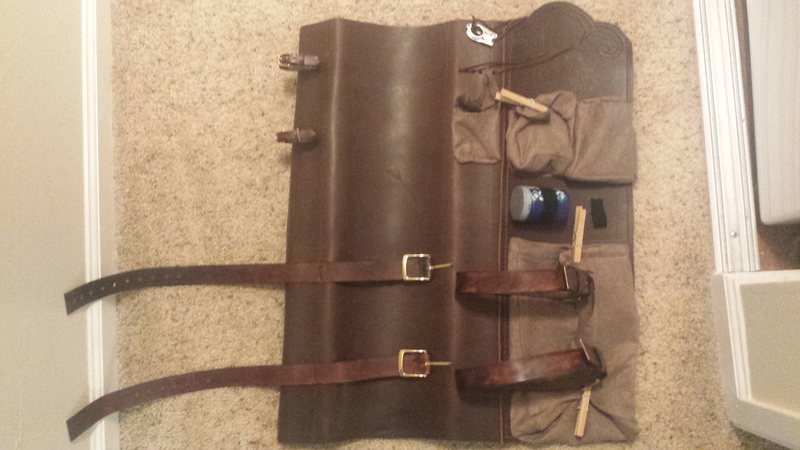 So then I went ahead to do a full prototype, working out the placement of pouches and straps for all my gear. As you can see the cloth prototype is a little droopy. The cool thing about this design is that you don’t need to lookat it to know which arrows you can draw without getting caught up on the other layers. You reach back, first to go are the ones that are tip- up, then you go through the shafts from tallest to shortest. This admittedly would not work very well if you used multiple lengths on your arrows, as you are relying on the height difference that the layering creates to tell you which arrows are which. So although the cloth prototype was quite serviceable, I disliked the droopiness of it. Not only did the droop not look good, but the way it collapsed in on itself prevented me from attaching my dagger sheath and other small accouterments to the sides. Additionally, I needed a thicker waist belt to better distribute the weight of all that gear. 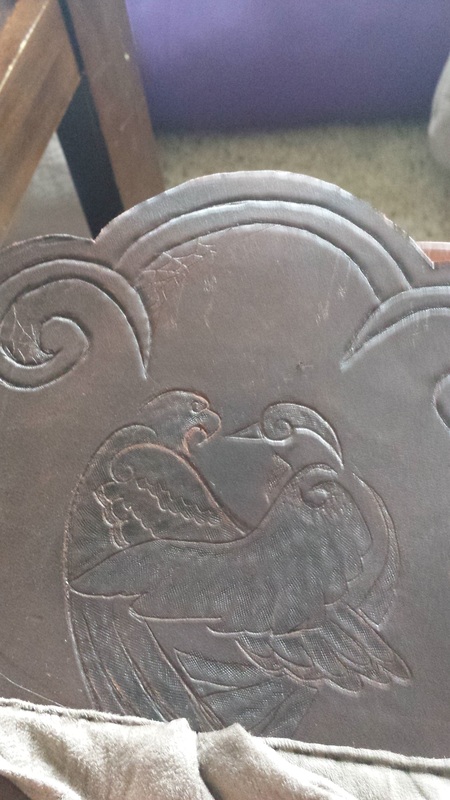 So began my first major leather working project. And I set forth to translate this prototype into leather. I ended up getting a beautiful dark red-brown side of leather, I’m not certain of the weight of it other than that it was definitely over 6oz in thickness and was close to a quarter inch thick in places. My brother was gracious enough to let me borrow his kit for the duration of the project so that I could learn before investing in my own set. So of course the first thing I do is to take a small scrap and start playing with the tools to learn how they work. This photo is just after using the swivel knife, but before I got to work on any of the tooling. I was pretty thrilled with how smoothly the swivel knife handled the spirals and curves, I really wasn’t expecting that. This is after dicking around with tooling. I tried to use a groover to add to the pattern, but discovered that groovers like straight lines, not curves. It came out alright, but that was the end of trying to carve out designs from the leather for this project. Though if I ever find a good tool for that I have so many lovely ideas, given how this dark leather carves away to a beautiful golden brown underneath. After that I cut out the main pieces for the quiver body. I decided to minimize the number of seams on the thing by having the side and back panels all be one piece curved into shape around the arrows. I sketched out the lines of the measurements on the inside of the leather, using the arrows themselves to check the measurement. Then I used a rag and some water to saturate the leather along those lines so that I could bend as sharp a corner into it as the leather would let me. I did this in two stages: first the two edges where the “side” panels met the “back” panel, second I bent the edges where the “side” panels would meet the front panel that I was going to sew on later. I did this in two stages letting it dry in between so that I could check the fit of the arrows at each stage, and not worry about accidentally changing the fit in a place I didn’t want to because it was still damp. I then started working on the front panel. Sadly I forgot to take as many photos of this part as I wanted. I used a mixture of chalk and eyeliner pencil to block out the locations of the pouches and straps first, so that I could see what kind of space I had to work with for tooling. funnily enough eyeliner pencil worked great for this, once it dried it didn’t really smudge, but it came right off with a makeup remover wipe! 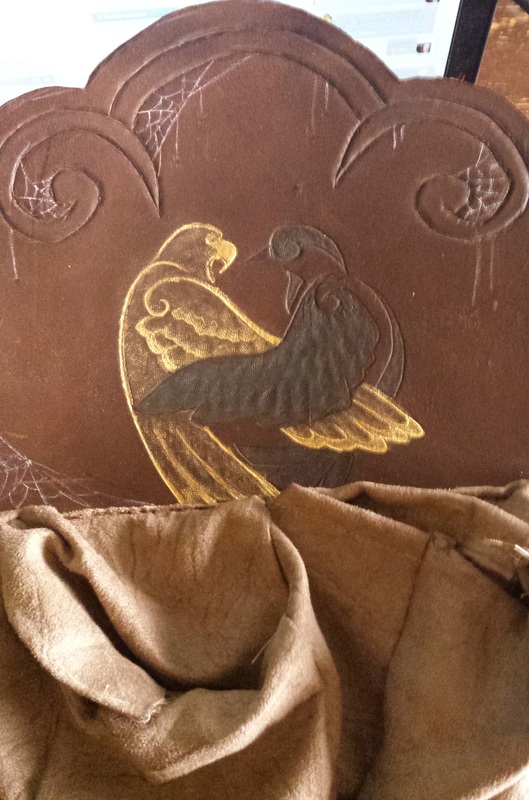 I had some fun figuring out how to vary the textures between the two birds when I was doing the tooling. Additionally I figured out that I could work the spider motif in by littering the corners of the design with webs. 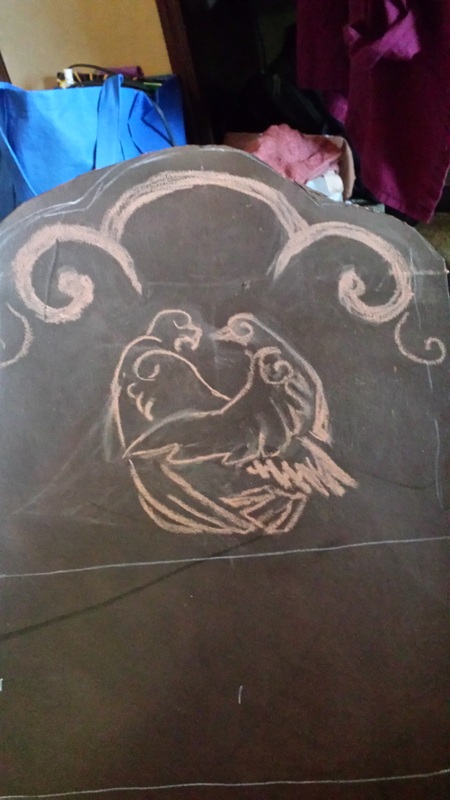 It really took painting the design for the birds to really “pop” and be recognizable as an eagle and a blackbird. 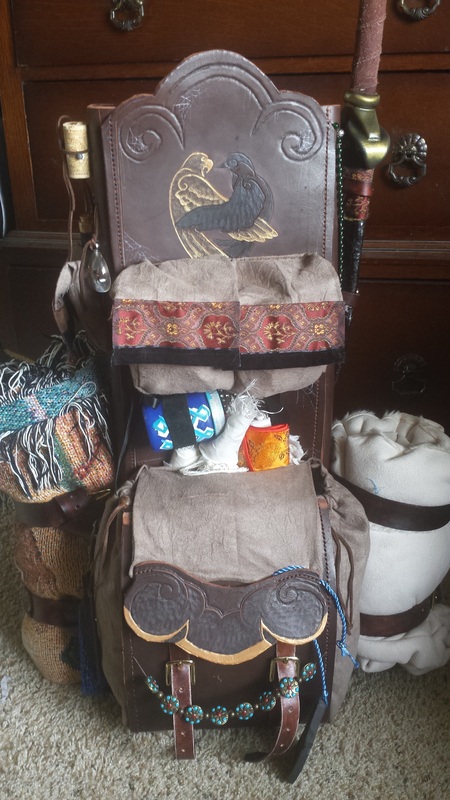 You can also see in the previous photo and the one below that I sewed on two of the many pouches that make this quiver what it is. 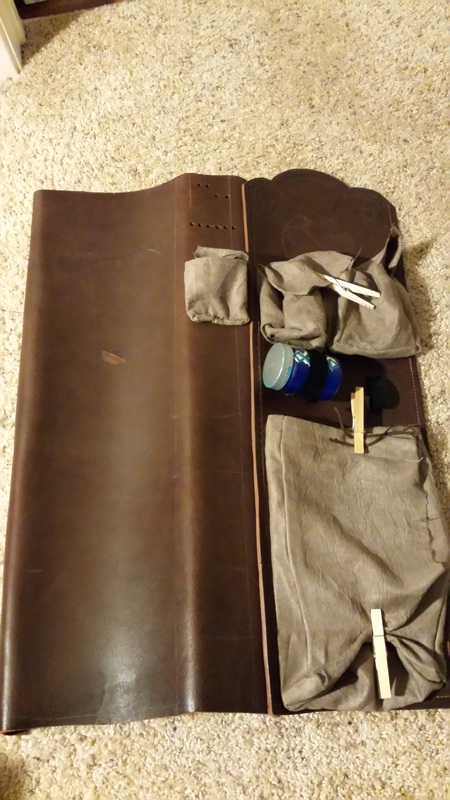 I happened to have a bunch of this lovely suede-cloth lying around, so I used that instead of forking out to make the thing entirely out of real leather. I’m not really convinced that this was the best idea, it was actually really hard to hand sew through this fabric. I am curious to find out if it is easier or harder to sew through real suede. Once I finished tooling and sewing the pouches onto the front panel I moved on to sewing the front panel to the rest of the shell. The most tedious part of this for me was getting the stitch punches to line up right. Even had I been using a sewing awl, I am pretty sure that this leather is so thick that it would kill me to try to go through two layers of it without any pre-punched holes. However once I got everything lined up sewing it all together was kind of soothing, though it did make my fingertips kind of numb by the end of the evening. 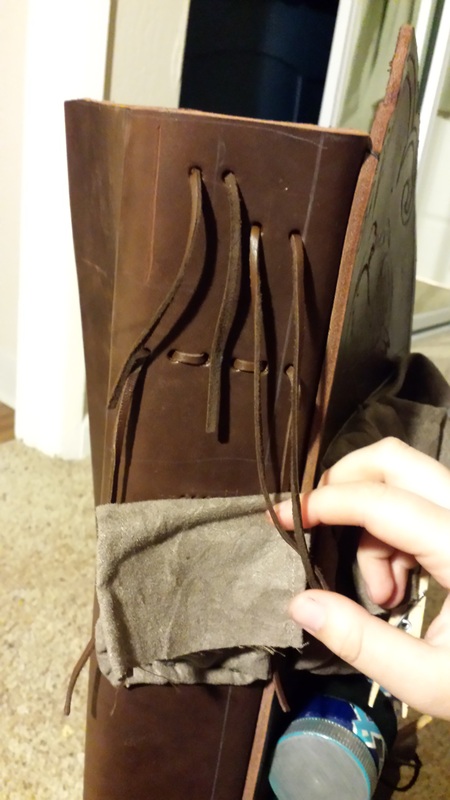 This photo shows that I had to pin down the main satchel, it tended to flop over the seam lines otherwise. So Here’s the whole shebang flattened out with all the pouches sewn on. You’ll notice that none of the pouches have their fasteners or decorations yet. That was one of the last things I did; next time I’ll do that before attaching the pouches to the body of the quiver. I have some holes punched that I’m going to be putting lacing through, for tying on small tools and accouterments. The little side pouch is for my sewing kit, for field repairs to costumes. 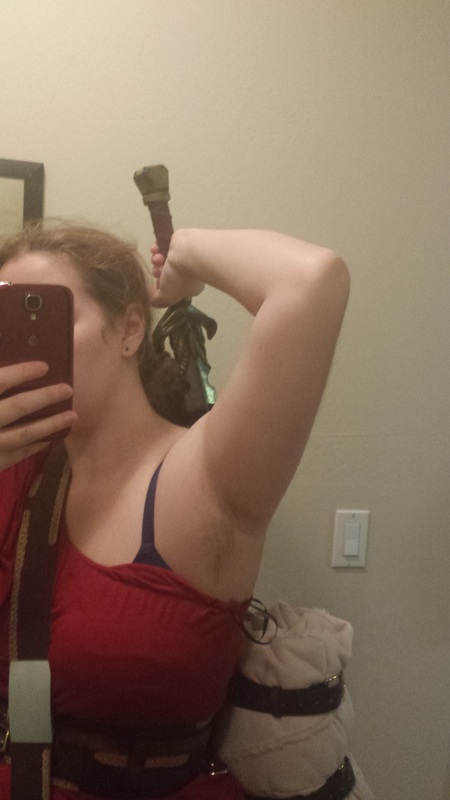 At this point the only things left to attach are the myriad straps, and belt loops. 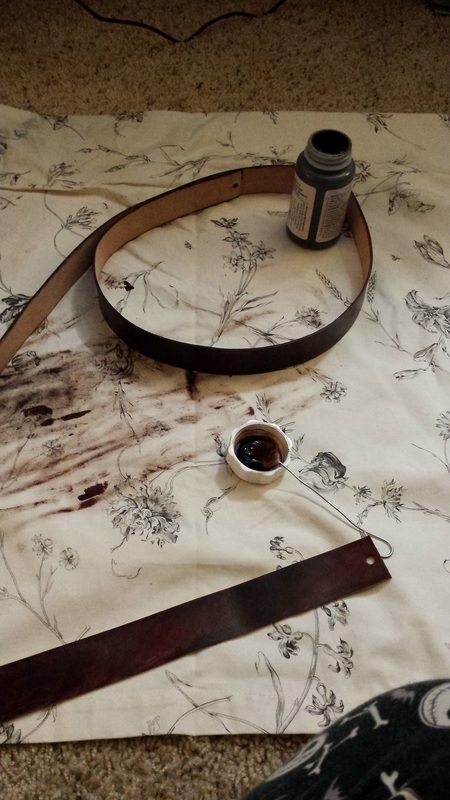 Shown here is the process of dying the belt blanks that I chose for most of the straps. I wanted a leather much thinner and more pliable for everything except the main harness. No individual strap is meant to be carrying much weight, so it should work out fine. I do however need to do a full weekend stress test to be sure that I picked the right leather for the job. Thankfully fixing new straps to the quiver should be a relatively easy fix should the need arise. So here the whole thing is splayed out with all the utility straps sewn on. 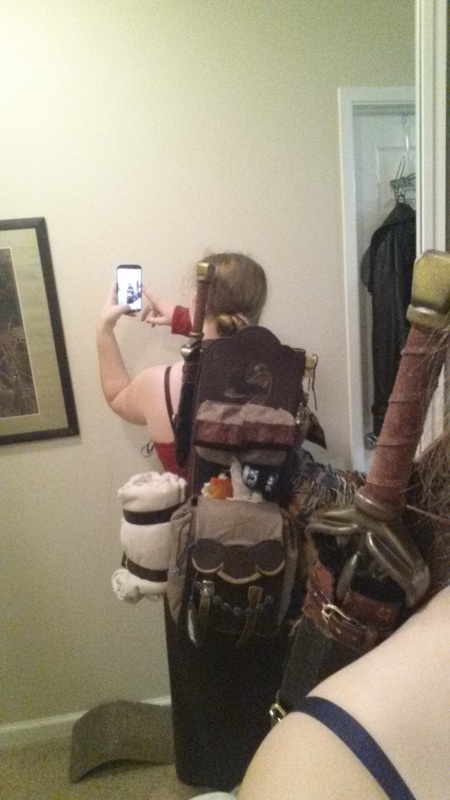 The four big straps, are for carrying things like bundled cloaks and such. 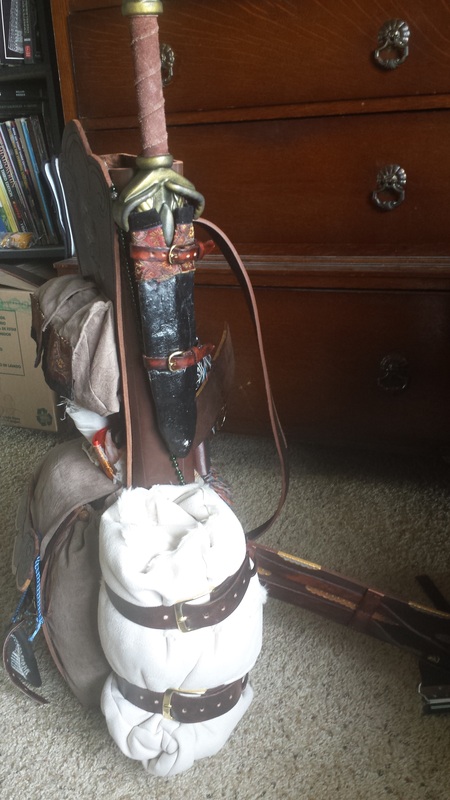 I am considering a different version where such things are strapped to the bottom of the quiver, possibly on a swivel so that the weight distributes better when it’s worn, but I think the whole thing stops being freestanding when set on the ground at that point. For me the ability to drop the quiver and use it as a ground quiver instead of a back quiver is a pretty big selling point, not to mention it’s nice to be able to ditch the quiver and not worry about it falling over and spilling everywhere. So from here I got distracted and forgot to take any more build photos. I tooled and designed a four inch waist belt to really distribute the weight of this gear across my torso. 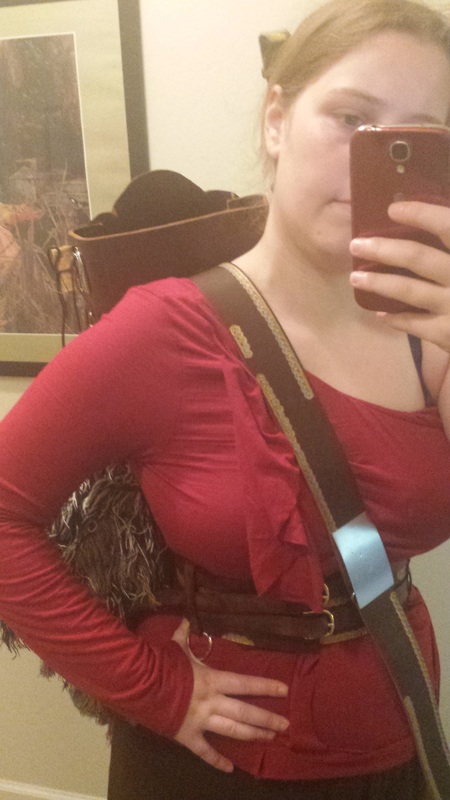 I went with a single shoulder strap that feeds into a hook buckle on the waist belt. The buckle is attached to the waist belt by a swivel stud so that I can change its positioning easily if the initial angle I picked doesn’t work out. Sewing up the final vertical seam was pretty trivial, though time consuming. Measuring, and sewing the bottom panel onto the quiver turned out to be a bit of a pain. I’m going to think on how I could make that part of the process easier. Rest assured future projects will have smaller gaps in the photographic documentation! This whole project was a massive learning experience that I really enjoyed. Yes I would do things differently next time. Is the end product functional, and maybe even awesome? Definitely. I’m going to finish this post off with a dump of the photos I have of the mostly finished piece. Higher quality photos are going to be coming soon.